Most kids are curious about everything around us. This set of Amazing World books are great. 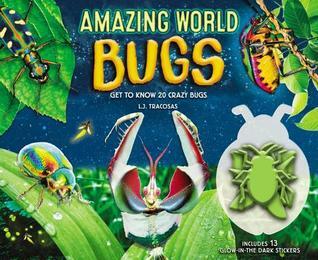 In this book about Bugs, you and your child will learn about 20 different bugs. Some of the bugs are every day and ordinary some are wild, strange, and anything but ordinary. While reading this book I learned of a few bugs I have never heard of. The book has large color pictures of each bug so you can actually see what the bug looks like. It also tells you where and how the bug lives, eats, and survives. Which ones bite or sting as well. The pages about each bug may be short but there are tons of facts about the bug. It also tells you the different types of bugs in each bug family, and their differences. The book is very interesting even to us adults. If you buy the paper book instead of the ebook it also comes with 13 reusable glow-in-the-dark plastic stickers.